I’ve completed my first sock! This is such a great stitch pattern to pick up and put down and work on in bits and spurts, it just zips by! I did a Fish Lips Kiss heel on this instead of the traditional heel flap in the pattern, and I have no idea how I did it, but I got bullseye stripes on the heel. I’m not expecting those on the second heel but I’m highly amused at how this first heel worked out. 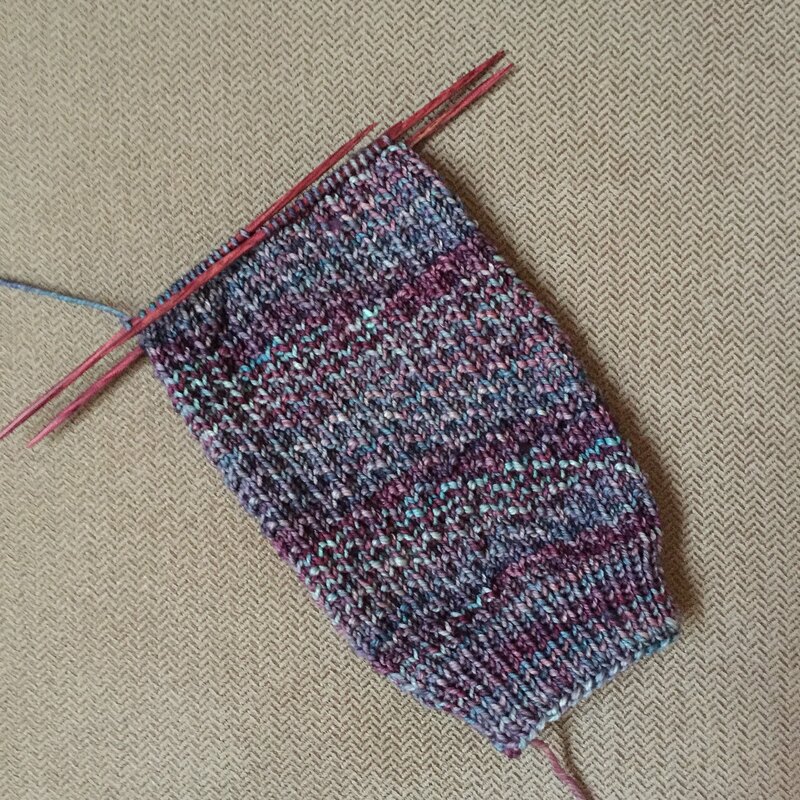 As you can see, I’ve started the second sock and I’m just past the ribbing. 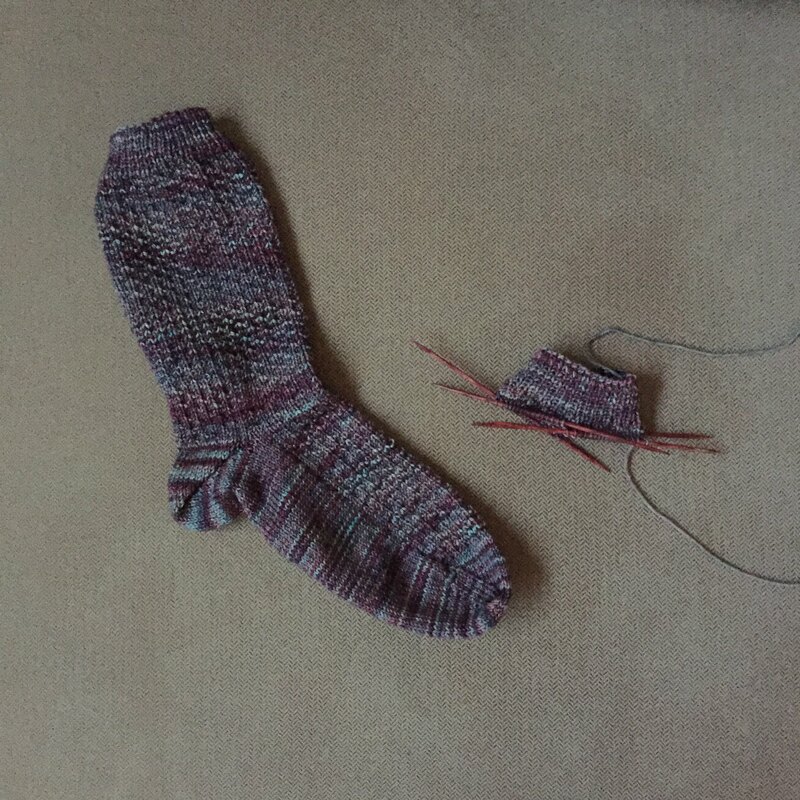 Hopefully the second sock will work up just as quickly as this first one did. A couple of weeks ago I showed you the beginnings of a new pair of socks. That has been frogged. I just wasn’t loving the yarn and stitch pattern combination. I love the colors in the yarn, but it isn’t really knitting up well in the patterns I’ve tried with it (I’ve tried three). It’s in a time out for now. In the meantime, I started another pair of socks, this time in a more subdued color way. The yarn is Malabrigo Sock in Lotus and the pattern is Hermione’s Everyday Socks. I’ve done this pattern before and enjoyed it and I knew it would work on this much more subdued color way. This is the first time I’ve used this yarn and I’m enjoying it. It knits quickly with no snagging or splitting and feels good in my hands. I’ve been using more Malabrigo in the last year and I’ve liked everything I’ve done with it. I’ve also loved the colors. The Lotus is pretty and it’s interesting, but it hasn’t grabbed me by the throat the way Aguas and English Rose have. That’s probably a good thing because I don’t need three or four garments in each of their colors! I’ve finally finished my third bobbin of Rook-y (that’s the color way)! This is eight ounces of singles of BFL/Tussah silk fiber. I’ve got to let the twist in this last bobbing set so that it’s easier to ply them. When a singles is freshly spun, the twist is active. This means if it pull some of it off the bobbin, it will twist back on itself quickly. If I let the singles sit for a bit, the twist becomes less active and when I pull it off the bobbin, it will either not do much of anything, or it will twist back on itself much more slowly. 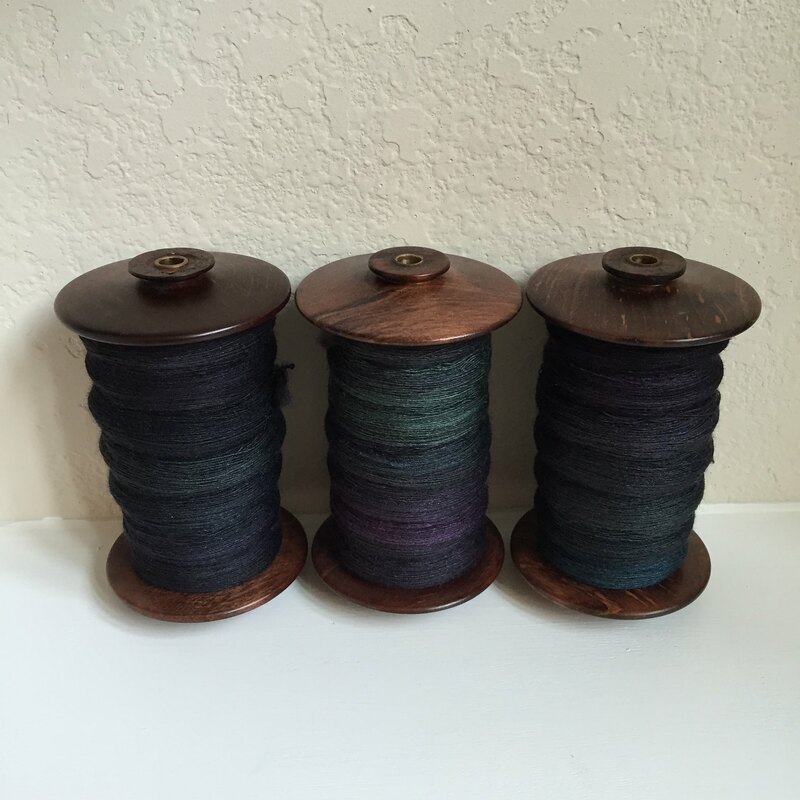 If I had spun all three bobbins quickly, the twist would be similar and I wouldn’t have to let them set a bit. Since I took my time spinning these bobbins, the first two bobbins have inactive twist, while the last bobbin is still active. If I try to ply them right now, it won’t be easy because of the one active twist bobbin. I’ll let the twist set for a week or so before I start plying and then it will all be much easier. 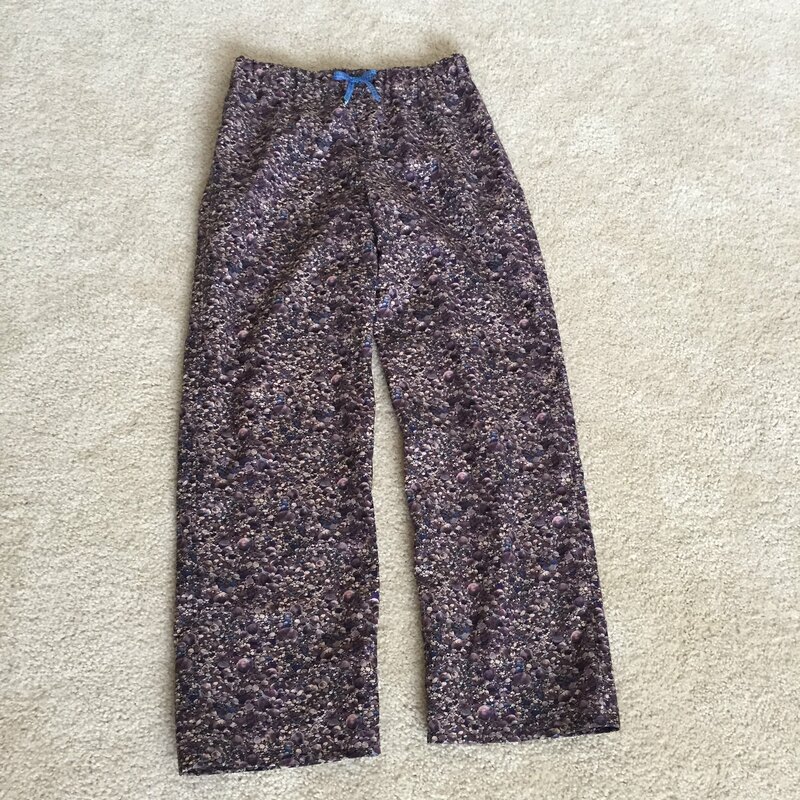 I made another pair of Margot pajama pants over the weekend! This was another piece of fabric I had in my stash that I loved, but it had no real purpose. 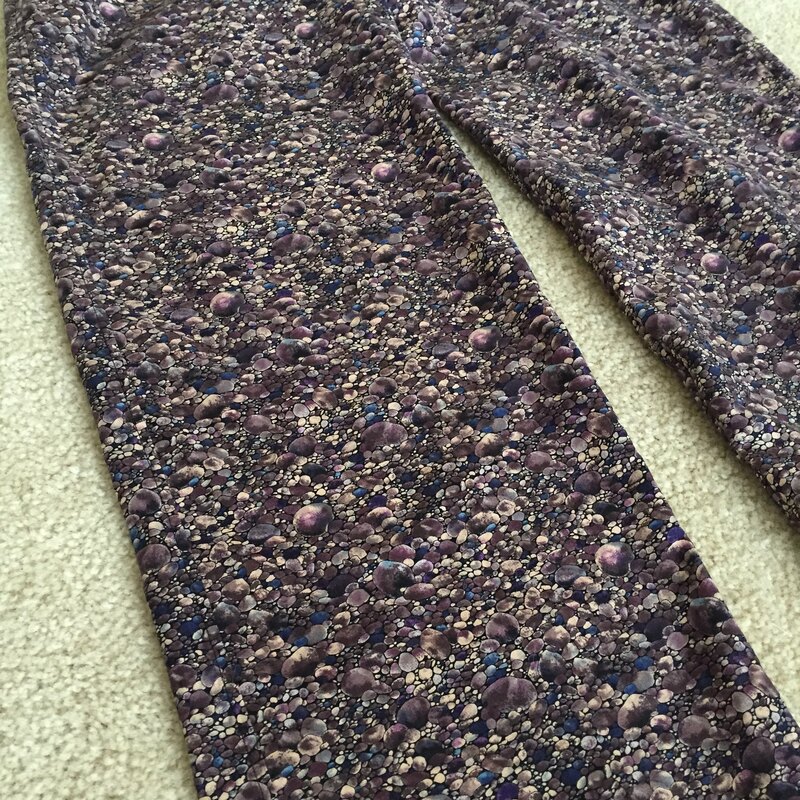 The print is river rocks, but they’re kind of a taupe color with blue and purple accents. (Maybe they’re river rocks on another planet?) This time around I skipped the drawstring entirely and just did an elastic waist. I did add a tiny bow to the front so I can tell the difference between the front and the back when I’m putting them on. (Unfortunately, this is more of a problem for me than I care to admit. Getting dressed is tough sometimes.) Tiny bows are not distracting to Max and he didn’t wake me up last night by attacking my pajamas. I think I’m out of pajama fabrics in the stash right now, but I definitely want to make some of these in flannel for this fall and winter. The pattern is super easy and they fit really nicely. 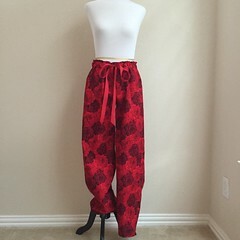 Honestly, I’m thinking about making a pair in linen as real pants, not pajamas! The pattern comes from this book if you’re curious. I did get the body of my pullover finished over the weekend! I haven’t woven in a single yarn end, but I’ll do that at the end. (This isn’t blocked yet either , I got it off the needles and tossed it onto Fifi. It will hang straighter after blocking.) Now I’m on to sleeves. Stripy, stripy sleeves! I’m hoping to get this sweater done quickly because I’m already planning the sweater I’ll knit next. Do you do that? Start planning your next project before you’re quite finished with your current project? I’ve gotten a lot done on my Seashore pullover since you last saw it! I’m past the striping section on the body and working on the lower body in the English Rose color. Since this is hand dyed yarn, I’m alternating skeins, switching every round. I didn’t alternate skeins within the stripes, but I alternated them from stripe to stripe. I’m to the point where I need measure my work because there is a split hem on this sweater, almost a shirt tail hem. 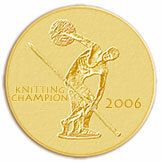 I’m hoping to get the body all knitted this weekend. I might not get all the ends woven in, but I’m hoping to get the knitting done for this section at least. 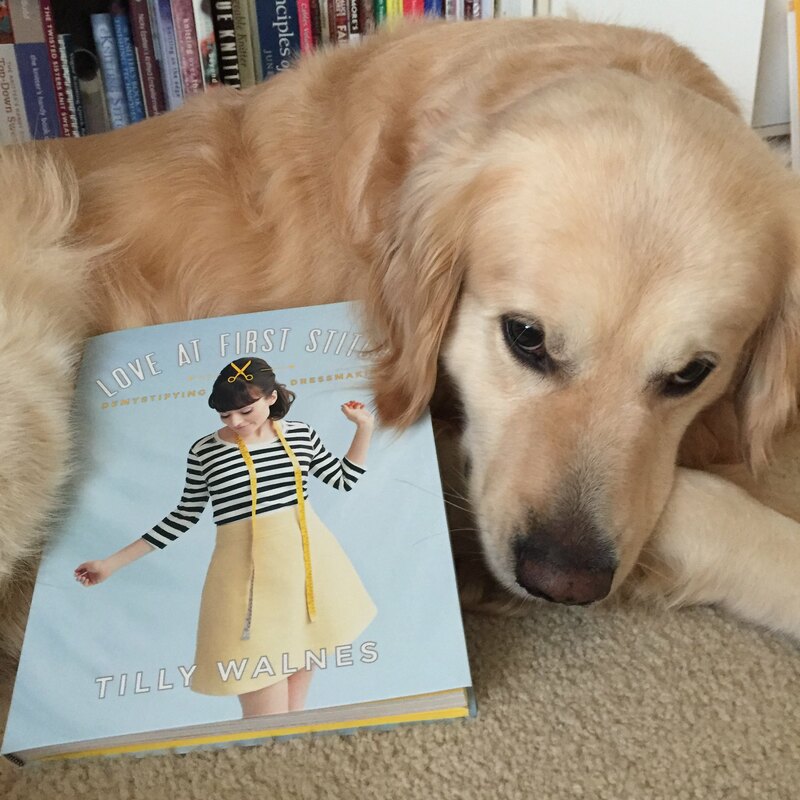 Last Saturday, I got the book Love at First Stitch from Amazon. Sunday, I traced the pattern for the Margot Pajama pants, and by Monday, I had a finished pair of pajama pants! I had bought this fabric years ago, before Caleb was born and it had just sat in my stash. 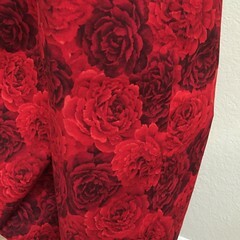 I thought it was pretty and I loved the 3-D realism look to it, but to be honest, it’s just too busy for me to wear and I use red in small doses in the house, so it was too much for a quilt. It sat in the stash, moved from house to house with us, but finally, when I saw these pajama pants, I knew this fabric had a purpose! I slept in them Monday night and they’re cute and comfortable, but I will be making an adjustment later today. You see, Maximus sleeps under the covers, usually beside my legs, but sometimes as low as my feet. Sometime in the night between Monday and Tuesday, I was woken up when my pants got attacked. I was asleep, so I’ll take Max’s word for it that the pants started it, but there was mayhem and craziness under the covers and I finally ended up stuffing the drawstring ribbons down the front of the pants. I didn’t have time to deal with them yesterday, so I slept in some pajamas Max is more comfortable with (that he doesn’t attack in the middle of the night). Today, I will be removing the drawstring ribbons, replacing them with elastic, and tacking a tiny bow over the buttonholes I made for the ribbons. I’m also going to be checking my fabric stash for anything else that might need to be pajama bottoms! As to the book, it’s geared for beginners, and while I’m more of an intermediate sewist (I hate the word sewer, that’s where toilets go, not a person who sews), at least when it comes to garments, there are still things that I need to work on. The book is wonderful, walking you through one (super cute) project at a time, building your skills as you go with great tutorials and lots of photos. Here is a link to all the patterns in the book. You’ll definitely be seeing more projects from this book! 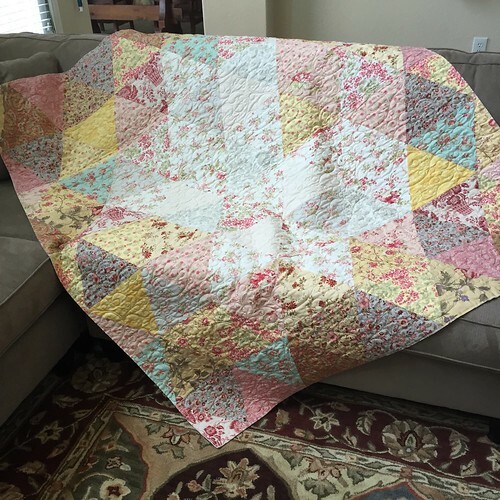 Camp Loopy 2015, Project 3, Finished! 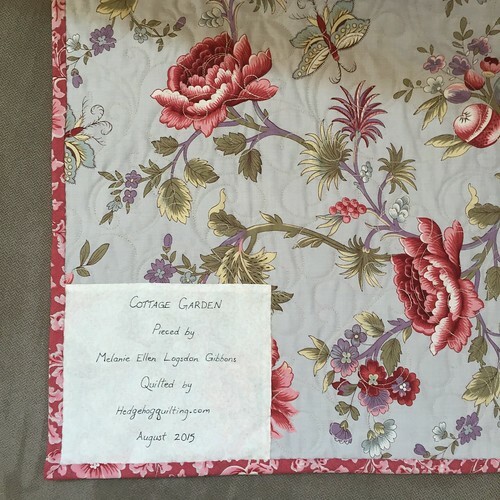 A detail of the binding at the front edge of the quilt. Once I got these pictures, I put the quilt down and Max saw it for the first time. (He slept through construction and didn’t get a chance to do quality control.) After sniffing it, he plopped down right in the middle of it and took a bath. A very thorough bath. 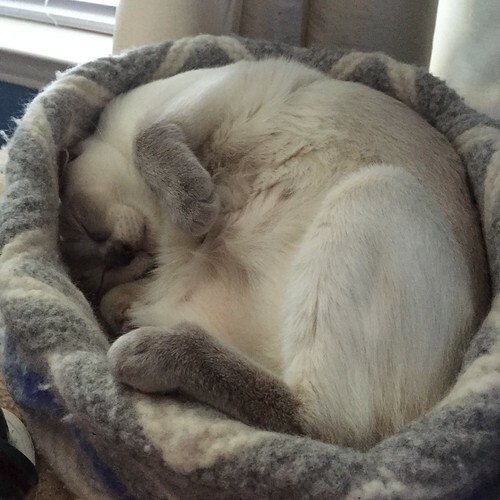 He’s taken several naps under it when it’s spread out, but when I fold it up, he curls up on top of it too. I think he’s claimed it as his own! 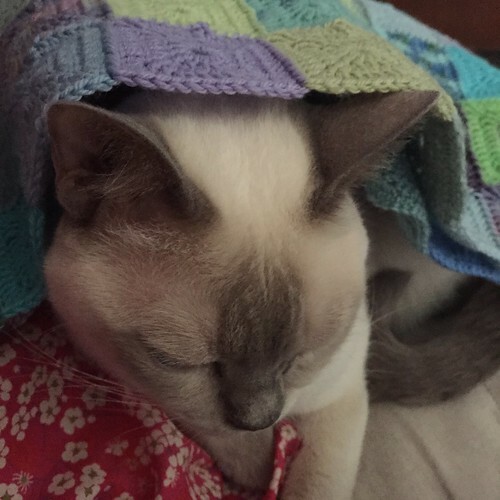 The photo below may be the last time the quilt and kitten were apart. 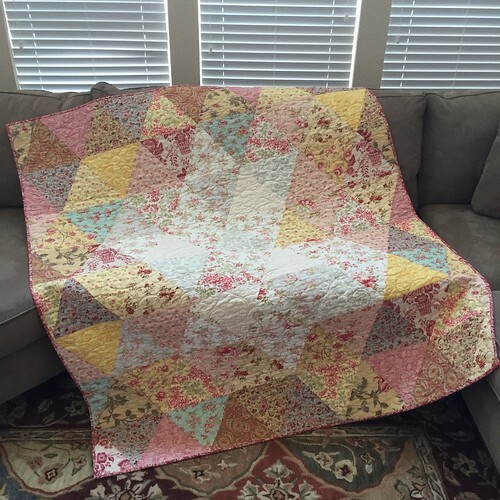 I got my quilt back yesterday! After making the top and seaming the backing, I sent it off to Hedgehog Quilting in Colorado to be quilted by Sheryl. Since Sheryl is a Loopy Groupie (and I think is actually a Loopy Elf as well), I didn’t have to explain Camp Loopy to her. She already knew and understood the time frame we were working with. 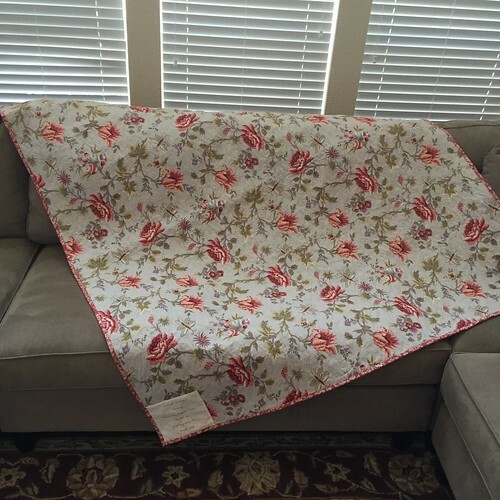 I originally contacted her back in July about the possibility of quilting my camp project and we discussed timing to allow her time to quilt it as well as shipping time, while getting it back to me in time to bind and finish it. We agreed that if I had it to her by mid August, she could get it quilted and shipped back to me ASAP so I could finish it. 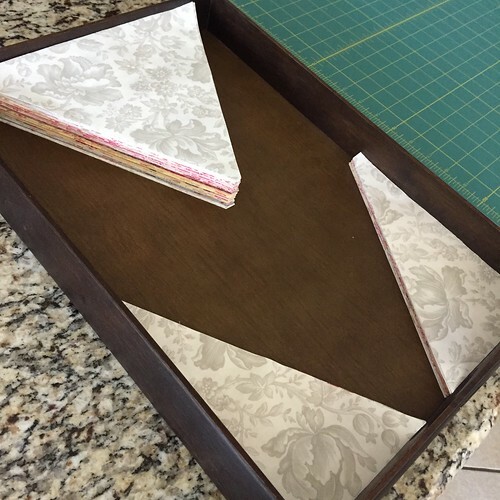 Fortunately, I was able to get the top pieced faster than expected so we had plenty of time. She still got it quilted and back in the mail super fast, though. 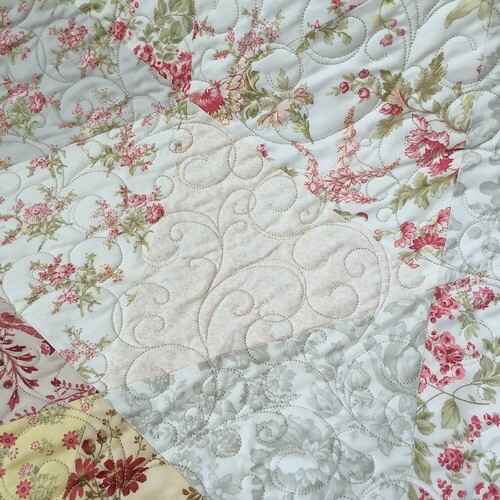 I chose an allover pattern for the quilting because I felt like all the florals in the fabrics would overwhelm anything else. I told Sheryl I liked a swirl pattern she’d used on another quilt, so she emailed me several designs with swirls and/or florals. The one I chose was a different swirl design from the original one I’d seen, but this one seemed more botanical. It kind of reminds me of vines or fiddlehead ferns. It really only shows up on the more tonal triangles, but I like the way it kind of fades in and out on the quilt. In the photos, I have trimmed off the extra batting backing left from the quilting, but I haven’t put on the binding yet. As soon as I took those photos, I took the quilt upstairs to my sewing machine and sewed the binding to the front of the quilt. I’ll start hand sewing it to the back later today! Hopefully Monday I’ll have a finished quilt to show you! More Crochet, Now Even Wider! The last time you saw my crochet blanket spread out like this, it was only five squares wide. 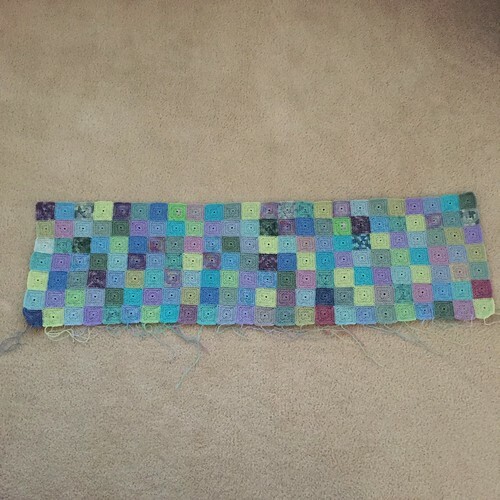 Now it is seven squares wide! In other words, it’s wide enough for Max to snuggle under and take a nap. It’s not finished yet, but it’s already serving a greater purpose in the world - keeping the kitty warm. Yesterday I did some cutting. 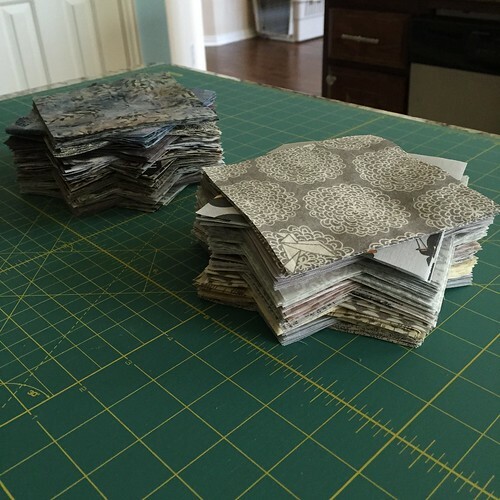 This is about 300 squares in various shades of gray. They’re sorted into a light gray pile and a dark gray pile. I’m starting a new quilt and these squares will eventually be half square triangles, but I have to cut more squares of the background fabric and do some sewing before I cut them into triangles. I have a lot more squares to cut! In May, when I finished my Loopy Academy extra credit project (Ondine), I knew I wanted to use those colors again. Together. In stripes. In fact, when I ordered more of the Natural to finish the crochet edging, I also got more of the English Rose. I got enough of both colors to do a pullover. 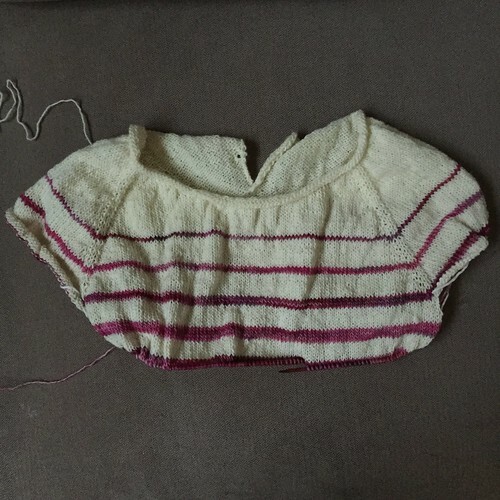 This past weekend, when I finished sewing up my Alpengluehen, I started on a Seashore pullover using Malabrigo’s Mechita in Natural and English Rose. (Yes, that is the same designer of the Alpengluehen and also Ravello.) I’m using the same striping sequence I used on my Tea With Jam and Bread. That is: 1 round pink, 9 rounds white, 2 rounds pink, 8 rounds white, 3 rounds pink, 7 rounds white and so on until I get to 9 rounds pink, 1 round white and then the rest of the sweater is pink. I’ve got two balls of the English Rose and being hand dyed, there are differences, so I’m alternating them for each stripe. If I’ll be knitting an odd number of rounds for the stripe, I knit from Ball One. 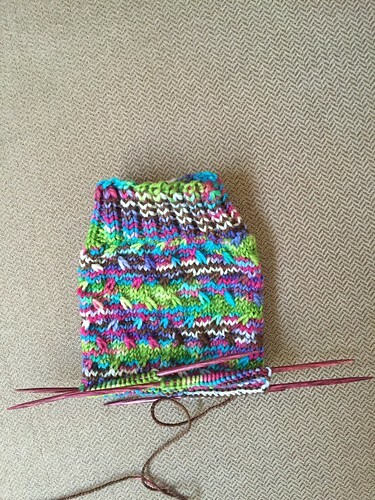 If I’ll be knitting an even number of rounds for the stripe, I knit from Ball Two. I have the balls in marked ziploc bags to keep them straight. After the striping sequence is finished, I’ll alternate the balls every other round. Yesterday afternoon I got to the point where the sleeve stitches are divided from the body stitches, so the rounds are faster now. 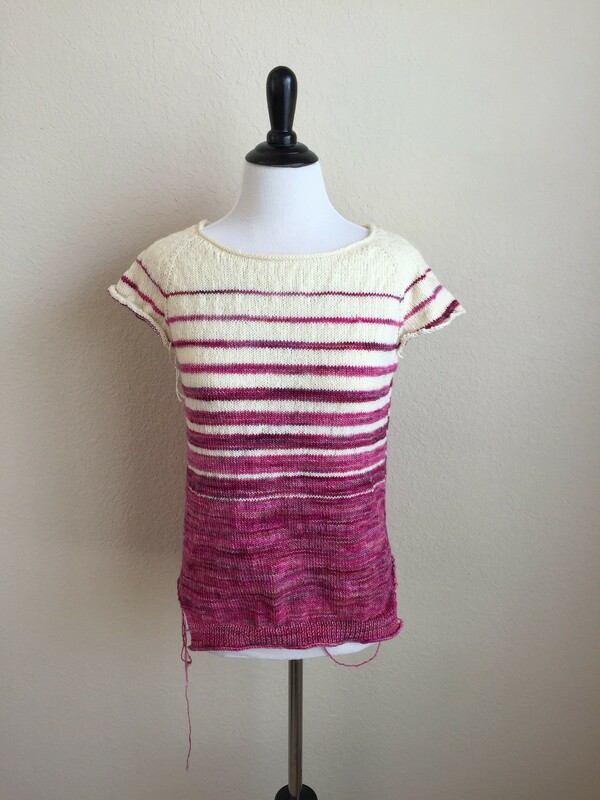 Also, I’m really amused at watching the colors in the pink stripes, which makes the knitting seem to fly. How is Max dealing with all this striping excitement? With his usual style of course. My Alpengluehen (Alpine Glow) cardigan is all finished! 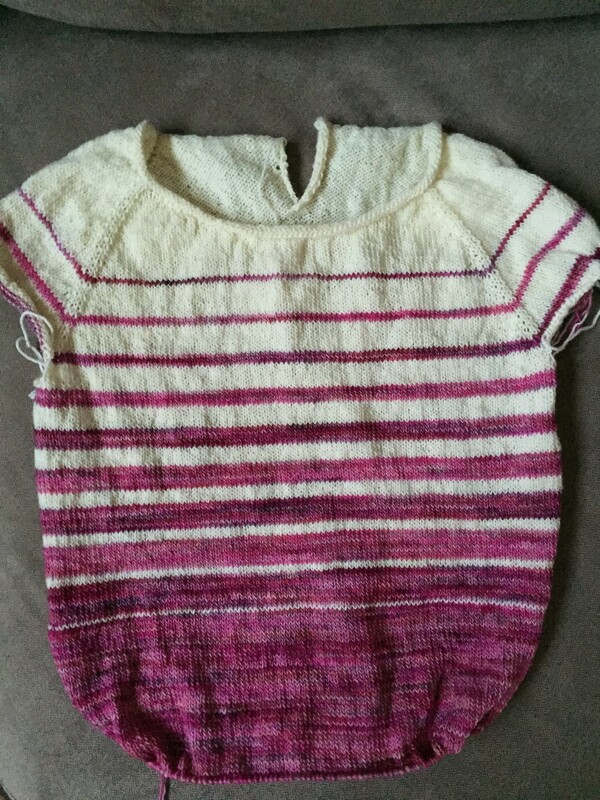 I’m thrilled with how it worked out and it was actually very quick to knit. 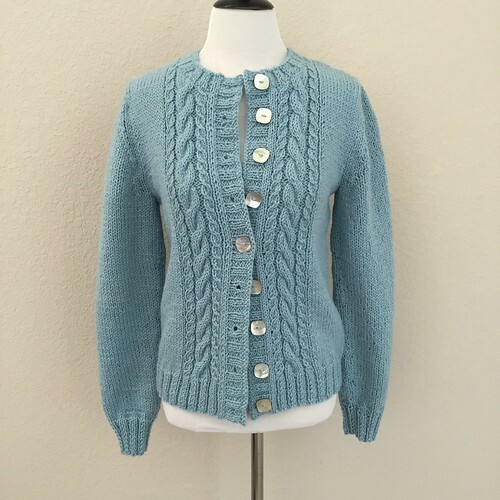 I used some Jaeger Shetland Aran weight yarn that I’ve had in my stash for a while and I found the pearl buttons on Etsy. Now, once the temperature drops, I’ll be ready to wear it! I’ve been working on my Alpengluehen cardigan, but I ran into a problem. I was picking up stitches to knit the sleeves and I realized that my row gauge was off. Ordinarily this isn’t a problem, most patterns have you knit to measurements for the most part anyway. It becomes a problem in this type of pattern where you pick up and knit your sleeves from the top down. If your row gauge is off, you will need to either pick up more or less stitches than the pattern calls for and then your sleeves won’t fit. I’ve tried to adjust things while knitting the sleeve and that doesn’t really work very well either. 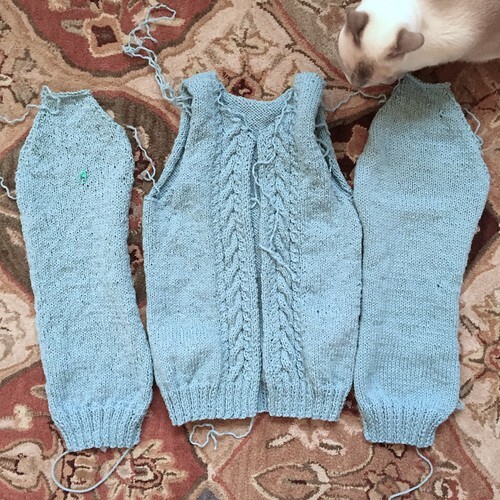 I pulled out what I had done and decided to knit the sleeves separately, from the bottom up. Since I was going to have to write my own sleeve pattern to fit the armscye anyway, I figured I’d just knit the sleeves flat so I could do them at the same time. I sat down with the pattern and a calculator and Max and got to work. Several sheets of scratch paper and one badly drawn diagram later, I had a sleeve pattern. I finished knitting them last night and once I have all 70 million ends woven in to this sweater, I’ll sew them in and make sure they fit. (I’ll probably also block things first.) It wasn’t a perfect solution, but I think it will be a much better sleeve than if I had used the pattern directions, knowing that I was off on row gauge. I’m not going to add my sleeve adventures to my Ravelry notes because I think it will just confuse things for other knitters. There’s nothing wrong with the pattern at all, I just didn’t knit it correctly and then had to compensate. The next time you see this sweater, it will be finished! Surprise! These aren’t self striping! The yarn does have a lot going on though. This was my second or third attempt to find a pattern other than stockinette with this yarn. I’m using the Rainy Day socks pattern because the slipped stitches break up the patterning of the yarn somewhat. I knit this pattern before, years ago, possibly even pre-blog. I’m not sure when I knit my first pair of socks in relation to the age of the blog. The yarn? It’s Western Sky Knits Aspen with Nylon in the Ali color way. I don’t usually go for such a wild color way, but something about this grabbed me and I wanted to knit socks out of it. I just love the colors. What surprised me as I was doing this was how the yellow tonal just blended in with the other fabrics. In the stack of fat quarters, when it arrived from The Loopy Ewe, that yellow stuck out like a sore thumb. Once I started messing around with the layout, the yellow fabric settled down and played nicely with the others. If it had been too bright, I was prepared to flip it over and use the wrong side. The yellow was part of my Short Stack, so I had to use it, but frequently the wrong side of fabrics is lighter and more subtle than the right side. Yesterday I started sewing the top together. (I had to have a discussion with Logan who wanted to roll and snarlfle the pieces I had spent hours getting just where I wanted them. He ended up being on the other side of the child gate while I sewed.) I was really glad to have taken photos Saturday because it was easy to get the pieces flipped as I sewed them together. Since I had the photos, I could double check that I had each row assembled correctly before I sewed it together. I know that obsessively checking each row saved me some time with the seam ripper. 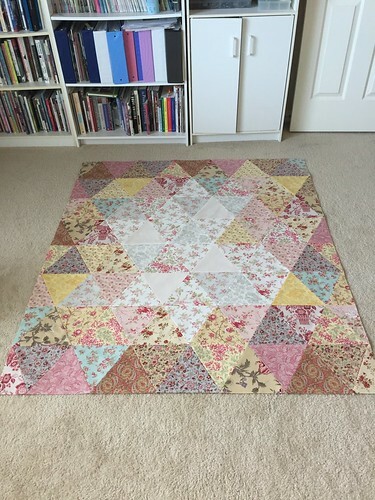 By yesterday afternoon, I had a finished quilt top! 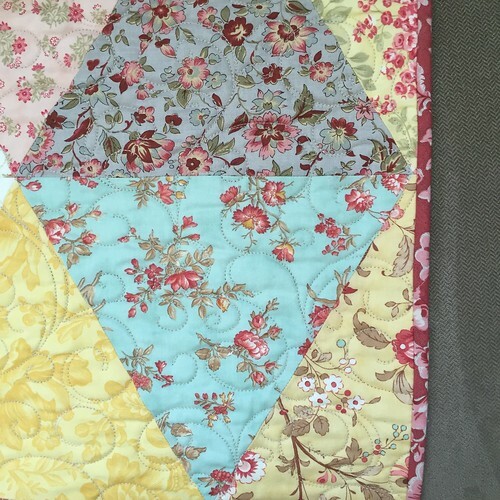 This is a super easy pattern as long as you cut carefully and are gentle with your triangles (two of the sides are bias and will stretch if you’re not careful). 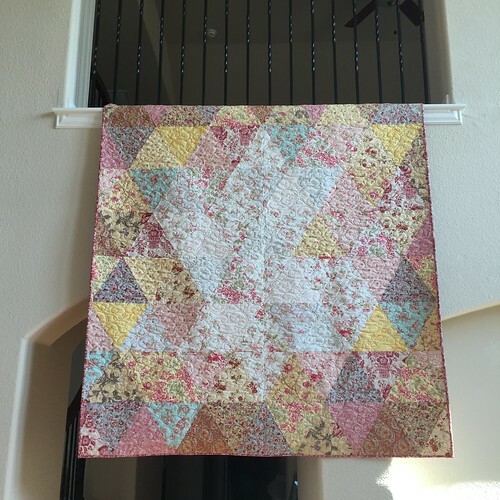 The piecing was fast and since there are no borders, once the rows are stitched together, I was finished. Today’s goal is to get the backing sewn together.